Maleny’s natural beauty, thriving village and passionate community have created one of the region’s most vibrant towns. Maleny’s natural beauty, thriving village and passionate community have created one of the region’s most vibrant towns. It’s a popular destination with day trippers and weekenders, who drive up the mountain from the Coast or Brisbane to sip coffee and check out the shops on the busy main street, take a stroll through remnant rainforest or enjoy a Sunday drive through the pretty rolling countryside. It’s a town that is cosmopolitan, yet proudly rural, hip and down to earth, eco-conscious and arty. The perfect escape. Glenn Rogerson and Graham Young are two such escapees – they were drawn to the town from Brisbane to purchase what they describe as a dated ’70s home, and while the house was, says Graham, “really drab”, it now reflects the style of its owners and is the perfect base to enjoy life on the range. While the home was built decades ago, it had been renovated and extended, but not in a pleasing way. It was a big job to create the four-bedroom, three-bathroom beauty it is now. Walking through the rooms, it’s hard to picture this home, the couple’s weekender, as anything but gorgeous – with its timelessly elegant and surprisingly fresh spaces. It’s the perfect antidote to their city life – Graham and Glenn’s weekdays are spent in their home in Brisbane’s New Farm. 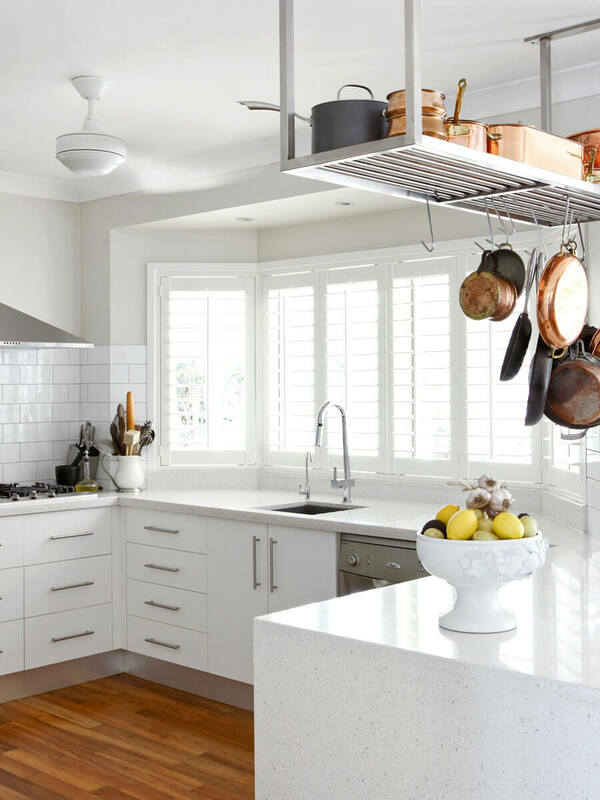 Updates to the heart of the home, the kitchen – which features window shutters that invite in natural light, white cabinets and spotless Caesarstone benchtops – have created a space that is open. “It is simple and clean,” says Graham. While the room isn’t large, it feels airy and bright. The same materials carry into the bathrooms, which thanks to the natural light are also bright and fresh. Surprising additions, such as a striped chair, hint at the owners’ personalities and add interest. The living areas – which are also painted white – feature timber flooring. Rugs soften and add an extra layer of warmth and texture (plus dramatic pops of colour) while the timber furniture makes the interior feel grounded. While the main bedroom is at one end of the home the three guest bedrooms are at the other – perfect for when friends come to stay. Over the years the couple has collected pieces such as art and pendant lights and these give the home a touch of drama. There is also a nod to the ocean – this is a Sunshine Coast home after all – with cane chairs, a model sailboat and the odd glass jar full of shells. “We just like light and airy,” says Graham, when asked about his interior style. He adds that the home is comfortable in winter and a good retreat from the heat in summer, though like many verdant areas on the Coast, the garden explodes in summer. But Glenn keeps it under control. “There are lots of nice spaces in the garden,” says Graham. Like the interior rooms, the outside provides a tranquil spot to sit and enjoy the peace of the hinterland. And if things get too quiet, the couple can always head into town. But with a home this beautiful, why would they want to leave!